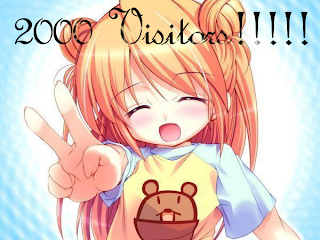 Today I will post an extra post, because my weblog has officially had over 2000 visitors!!!!!!!!!!!!!!!! I'm a little late with this (as the counter is currently on 2048) but apparenlty during my stay in Birmingham the counter on this weblog hit the 2000 mark! I am so happy! I am very grateful to everyone who reads my posts. I will really do my best to keep posting funny or interesting posts so people will keep reading them!